Notes | Horst Faas and Tim Page, two photographers who worked and were wounded in Vietnam, have gathered many thousands of pictures by those who were killed. Their search has taken them through the archives in Hanoi as well as those of Western agencies. In some cases families have generously provided access to private files where unknown bodies of work have lain unseen for more than forty years. The list of the dead includes some of the greatest photographers of the century, such as Robert Capa and Larry Burrows, and some who had been working in Vietnam for only a matter of days before their deaths. A number of the Cambodian photographers working for the Western press were executed. Other photographers, like Sean Flynn and Dana Stone, disappeared. Their loss inspired Tim Page to begin this memorial. The resulting sequence of photographs follows the course of the war and the transformation of the serene landscapes of Cambodia and Vietnam into scenes of nightmarish devastation. Comments | [10/15/10] Excellent excellent book - well designed and well shot. As a combat veteran of that war, and as someone who has since lived in Viet Nam, I was asked by a Vietnamese photographer friend to bring him a copy - that's how I found out about it. If you want to see both a well done tribute and see how it was done in the 1960 - 70s, this is a great book to get. Comments | [05/03/04] I havn't read the book, however there is a traveling exhibition of the Requiem photographs located at the NC State University Library until late May. Awesome and chilling photographs. I highly recommend making it a day trip if you live in North Carolina. Comments | [02/02/03] I had to have this book. Not only are the full page pictures amazing and astounding, but it is full of historical information, references, and documentation. I definately reccommend picking one up and take good care of it because it may be worth money some day. Comments | [02/01/03] Wow.. an Amazing Book. I look forward to doing the same when I am old enough. R.I.P. They died doing something they loved. Comments | [01/29/03] Seeing a photo taken literally steps before the photographer stepped on a land mine and died is a pretty chilling experience. Classy, outstanding book. Comments | [01/15/03] Yes, great book indeed. But I spoke with some of the Marines who worked in the Da Nang Press Center and they were sorry to see that no active duty combat correspondents who were killed had any of their work featured. They thought there were some politics behind the reasoning for leaving them out. Comments | [01/15/03] This book is nothing short of amazing. The pictures speak for themselves, a great insight to this conflict. 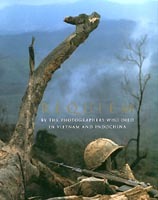 But the most astounding thing about this book is the fact that every photographer featured in it was killed in vietnam. In a time where our country is cruising into war, this book is a must read.